Rambo gate was closed when I arrived during a normal duty day so we had to turn around in a space near the gate that seemed to have been created by others in the same situation. I had no issues pulling a 43’ fifth wheel trough the main gate. Sites are as described in a previous review. Some close together some not. 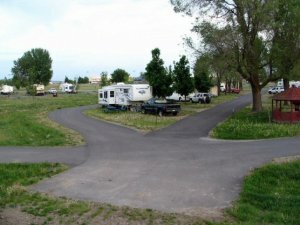 Mine was close and had the waste connections of the rv next to me in my picnic area. Camp host was located in site 25. Close to state parks and access to the river. The camp has been completely full since my arrival with several rigs in overflow. The rate is now 20/day with no weekly rate or discount.